This session is an experiment, a dialogic three-way game. 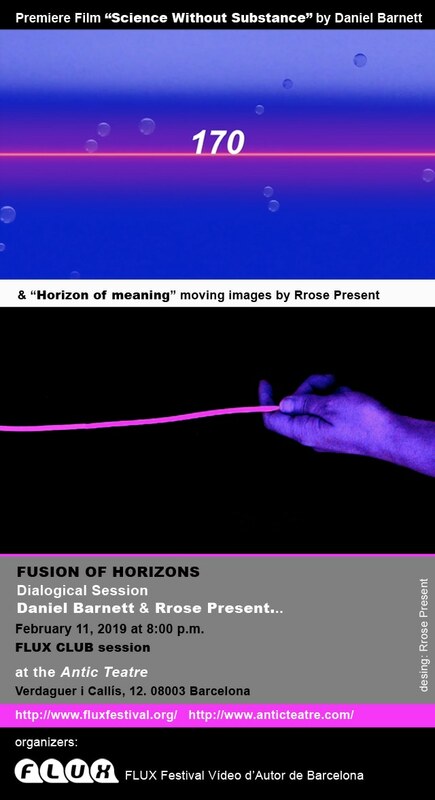 Rrose Present reinterprets Daniel Barnett's film looking for a linguistic / experimental relationship between-his-images. Extending this dialogue to the audience, to see the surprise World premiere of the film Science Without Substance, you have to accept the game proposed by Barnett: See the full film and write 50 words about the film. Thus the work will be completed by the viewer in a FUSION OF HORIZONS. Science Without Substance follows the hapless band of the lost through a landscape that changes dimension as they try to discover WHAT IS HAPPENING? When watching for the first time "Science Withot Substance" my head exploded in a thousand questions. So I decided to respond with images "to say everything that can not be said with words". Dialogical experiment that had already done in the project "think with your hands" (Private dictionary of critical praxis of Concepts of philosophy of art and aesthetics 2009-11). Where (with irony) intended to replace the place of words, lapidary sentences, philosophy of art, visual metaphors. One of these pieces was "Horizonte de sentido". In which I worked on the idea of interpretations of works of art, that although we could not access its literal meaning (lost in time) was sensed as "horizon of meaning." And it is this intuition that illuminated this dialogical movement with Science Withot Substance. Working in illuminated time allowed me to understand something more about: What do your heuristic images think about? Thoughts that only with the word could not access.